In light of my recent sighting of the boys in One Call, I have been waiting for some time on some inspiration to strike me regarding the completion of an article about Travis Garland. 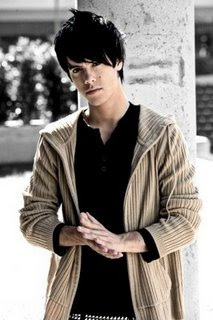 Like JJ Thorne of One Call, Travis is also a former member of NLT (Not Like Them), and is the only member of the former group who is pursuing a solo music career post-boy band (although, who knows what V Sevani is up to as news on him has pretty much gone dark). Travis provided the majority of the vocals for NLT (along with the other remaining member, Kevin McHale, who will soon be starring in the FOX television show "Glee" this fall -- but more on that when time timing's right). Take a look here and check the boy out. He sings the first verse and the much of the riffs toward the end (while Kevin sings the second). I was a big fan of NLT since I first heard their 'first' first single, "That Girl", back in 2006. What would be their final single, "Karma", was my #21st song on my Top 28 Songs of 2008 Countdown. Their breakup was due to a lot of unfortunate things -- the omniprescent delay, the label's struggle to market them correctly, the question of genre, the boy band stigma here in America, and finally, the magnetic pull of other opportunities. 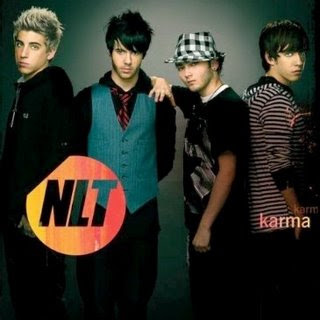 A lot of the issues with NLT (from left to right in the picture to the left: JJ Thorne, Travis Garland, V Sevani and Kevin McHale) was blamed on the extreme amount of leaking -- depending on how you wanted to look at it, people were either desperate to hear their tunes or desperate to knock a good boy band while they're down. Hindsight is always 20/20, but now that the group is officially over with no album having been released, it's nice that a lot of songs leaked, whether they would have turned up on an album or not. If they hadn't we wouldn't have a clear copy of this song (Travis sings the first verse and that "da didda da didda da" bit), which once I play it once, I can't get it out of my head for the rest of the darn day...They did not breakup due to in-fighting, and so long as that rings true, I wasn't too upset. But really, as long as I still get to hear Travis' voice, I'm still walking away a winner. Travis has one of those awe-inducing sounds, that has soul and cadence even though it seems so effortless. It's a mixture of R&B and pop, and makes him a perfect successor to the Justin Timberlakes and the Chris Browns of the world. He has officially joined the embarssingly long list of male voices who make my ovaries quiver upon first listen (which also includes Justin Timberlake, Gavin DeGraw, Caleb Followill of Kings of Leon, and way too many others to name...told you it was embarassingly long). Currently represented by Papa Joe Management (the father of Jessica/Ashlee Simpson), Travis is signed to Universal and is in the recording stages of his debut solo album. Several songs written by Travis and demoed by him back in 2007/2008 while he was still in NLT began to filter out and leak last year. The songs were not truly written for him, as he was very much dedicated to NLT, and if they weren't going to be used for his group, he had every intention of giving them to other artists. Several songs, including the ridiculously catchy "Electromagnetic", were written for female artists. That song in particularly was reportedly written for Ms. Britney Spears for her 'Circus' album but she ended up passing on it (stupid) and, or so I hear, it will now go to another Papa Joe artist that has recieved a little bit of buzz lately, An Ya. I'm having trouble deciphering which songs are new and which are older demos, because Travis' voice is so buttery and good that I just tend to like them all. The latest is "Can't Wait To Meet Ya", which you can hear at his MySpace page. I'm quite partial to "Stranger", which is new-ish and is a possible reflection of his post-NLT style which is a bit more R&B and chilled out. "Glow Stick" also somewhat recently leaked, and it sounds very Chris Brown "Forever", so take that anyway you'd like. Sorry, I just fainted at the possibilties. I agree whole-heartedly to all you wrote about here. So many guys in boy bands feel that when the project busts, they are fully capable to go forward alone, when for the most part, that ain't the case. In the case of Travis, though, he most definitely can -- I just hope he gets the promotion and attention he deserves.